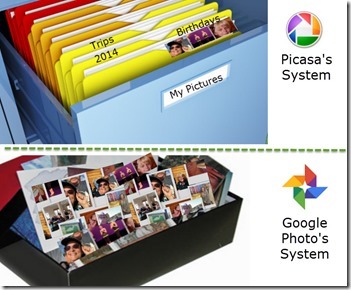 Picasa and Google Photos: What is the Difference? – Learn Picasa and Google Photos! 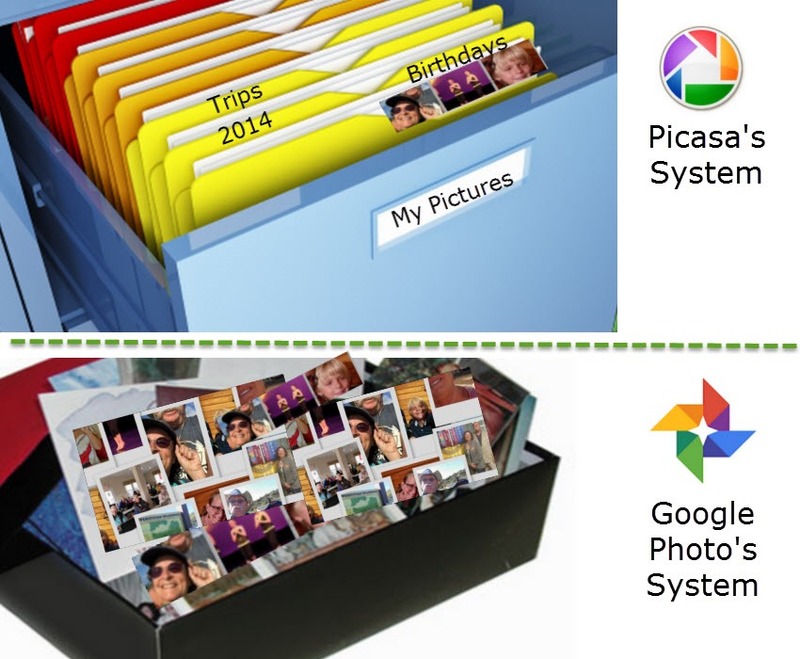 Picasa and Google Photos: What is the Difference? First of all, what is the same about Picasa and Google Photos? Why are we talking about them both in the same article? And, why are both Picasa and Google Photos the subject of this website? It’s because they are both photo management tools by Google. But that’s where the similarity ends. Saying that Picasa and Google Photos are both photo management tools, is like saying that a car and a jet are both transportation tools. Although it’s true, the two serve very different functions. 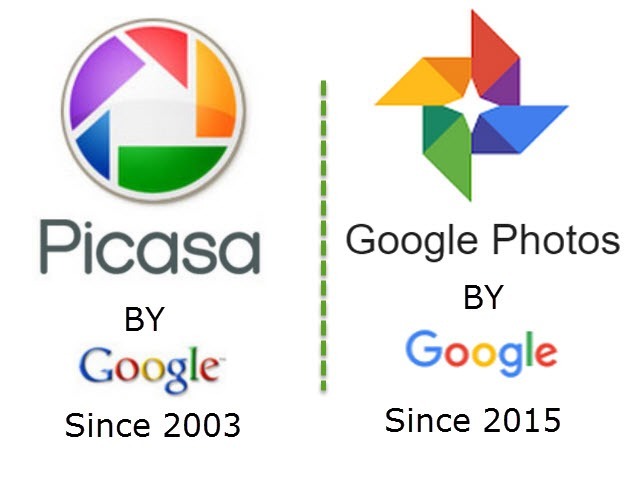 Picasa has been around since 2003. Actually it started well before that, but it was purchased by Google in 2003 and became extremely popular in the following years. Google Photos is a brand new product by Google, built from the ground up to be a tool for photos and videos in today’s mobile and cloud world. It’s official announcement was in May of 2015. Watch the Google Photos launch video for a great overview. PIcasa is software for your PC or Mac computer to manage photos on your computer. Picasa is for people who want to organize and work with photos on their computer. Google Photos is web-based storage (in your Google Account) of all your photos and mobile Apps and Web interface to work with them. There is no computer software for Google Photos, you use a web-browser interface and Photos.Google.com, photos must be uploaded to your Google account online to work with them in Google Photos. Google Photos is for people who, potentially, don’t even have a computer. They use smartphones, tablets, and cloud (Internet) based resources. You get Picasa by downloading the free software to your computer from www.picasa.google.com. After downloading it, you no longer need the Internet. It is old-fashioned computer software, like what we used to buy in boxes and install from disks. It does have a feature to upload photos to the Internet, but that is secondary to its main function. In its early years, when you uploaded pictures to your Google Account, that was called Picasa Web Albums. Now it’s called Google Photos. It is this history, from PIcasa Web Albums (2006-2012) to Google+ Photos (2012-2015) to Google Photos (2015…) which causes much of the confusion. You have the Google Photos service simply by having a Google Account. Get Google Photos for your Android devices by installing the free App from the Play Store. You get Google Photos for your iPhone or iPad by installing the free App from the App store. You use Google Photos on your computer thru a web interface at www.photos.google.com – you must be logged in to your Google Account. If you want Google Photos to upload all the photos currently on your computer, you also need to download the Desktop Uploader from www.photos.google.com/apps. Picasa works with photos, on your computer, in folders. The folders are those folders that you create on your computer’s hard drive, usually within the My Pictures folder. Every photo must be in a folder. I keep 50 – 500 photos in each folder. If you delete a folder of pictures from your hard drive they are gone from Picasa’s view. Google Photos works with pictures on the web, in your Google Account. There are no ‘folders.’ Your Google Photos library is like one giant shoebox of all your photos. I have roughly 50,000 pictures in my account. All 50,000 are in one big dump simply called “Photos.” Google Photos then gives you tools to view those photos in different groupings: by day/month/year, by person, by place, by thing. It’s magic. You do not do anything except click on the view you want. If you want custom groupings, you can also make Albums in Google Photos, but it is not required. If you make Albums, they are simply pointers to the pictures in the main library – like a playlist. If you delete photos from an Album – or even the entire album, the photos are still there in your Google Photos library. If you delete pictures from your Library, they are gone, they will also be gone from the Albums. If you are accustomed to dividing your pictures into folders, this is something you need to UNlearn in order to understand Google Photos. Picasa has some features that Google Photos does not. Picasa can add captions to your photos that are stored with the picture file itself and can be viewed by other software. I love captions. I cannot live without captions! Picasa can add a watermark to your photos. So, I will continue to use Picasa – then upload my pictures to Google Photos after adding a caption and a watermark. Picasa can add text directly to the picture. Picasa can create custom collages. Google Photos has many features that Picasa does not. Google Photos can share photos directly to Facebook, Twitter, Google+, or with a link it creates. Google Photos can combine photos and video clips into movies with automatic transitions and music. I LOVE the movies! The movies that Google Photos can make have revitalized my enjoyment of my pictures. Google Photos can make “stories” of a series of photos, video clips, and maps. 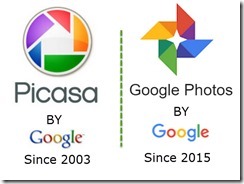 There’s LOTS more to understand, but I hope this gives you a foundation to understand the difference between Picasa and Google Photos. If you’re just starting to take photos, Google Photos is probably all you need. If you’ve been using Picasa for a while, keep using Picasa, but ALSO start using Google Photos – it is the way of the future. I read somewhere that Google will soon phase out Picasa (maybe already started) in favor of Google Photos. As someone who used Picasa, but found the duplication confusing, at this point would I be better served by concentrating on Google Photos? I have a slow learning curve! I’ve used Picasa since day one. There is still nothing to compare to it. Apple photos doesn’t match it. I’m glad that now Picasa web sync, syncs to G photos, not picasa web albums…However, G auto backup has the two options,high or original quality. Great. Picasa still syncs at either 2048px or original. 2048px is far less than the ‘high quality’ available through auto backup. Such a shame because if Picasa could upload at 16mb like the auto function it would be almost perfect. So now I use Picasa as a desktop tool with face recognition. Lightroom for heavy / batch processing and auto as a free semi-back up tool. If Picasa would upload at high quality G photos and picasa could become one. Craig – I agree completely. I am anxiously awaiting an update that allows Picasa to upload at the 16Mp size. I still use Picasa storage online for my Blogger blog. I have used it through all the changes of names, etc. And, yes, I have Picasa downloaded as well and use it for several purposes, one of which, is to transfer photos from the Sony camera TO my computer hard drive. It beats the less than stellar software that came with the camera. And, it has a great red eye remover tool. And, collages are wonderful. I do not use the Google Photos. I simply will never have enough band width to upload over 240 gigs of photos and I do not want them reduced in pixels for storage. My 3 external hard drives do storage very well, with full octane versions of the photos maintained. We each have different experiences and needs. Bless the choices available. Or, as they say, your mileage may vary. Yes, it is great that we can each use the tools as we see fit. I do want to be sure you realize that the “Picasa storage” is the exact same place as the Google Photos storage. When you upload, you are uploading to your Google Account. Go ahead and check out http://www.photos.google.com … you will see all the photos you have uploaded to Picasa Web Albums over the years. Chris or others, maybe you can help me with wrapping my head around the sync feature. I really want Google Photos to be my grand repository for all my photos – some are on my local laptop, some are on my phone. Once the photos are up in the google library, I would love to delete the local originals on my laptop so to free up space. If I delete my local originals, will they remain in the google library? And if not, any ideas how I can get around this? Also, since my phone is only 64GB, I will soon have the same need on this device (clear out local photos). Hope this makes sense. Deleting from your laptop will not delete from the online library. Synchronizing deletions only happens on mobile devices when you are using the Google Photos App. That said – I hope you are copying those pictures to some other local device before deleting from your computer. I would not want my ONLY copy of the pictures to be the online copy. I use Picasa on a Mac. If I use Google photo are my photos actually stored in the cloud or are they still on my computer and Picasa can still read them? If something were to happen to google photos if they got hacked, if they went out of business or whatever would I still have my photographs on my computer? I know Google photos is linked to my computer somehow but I don’t know who controls what or how ? Yes, your photos are still on your computer. The auto-uploader does just that, “Uploads” – nothing else. There is no automatic synchronizing between cloud and computer, just between cloud and mobile devices. I tried Google photo but found the uploading of pics to the cloud used too much of my Verizon 20gb monthly plan that I needed for other purposes, so I stopped the automatic uploading of Google pics to the cloud and now I’m no longer bumping up against my 20gb limit. I’ll stick with my Picasa. 2. There is a setting to use Wi-Fi only and thus not use up your metered cellular data. Another thing about organization. In order to group your photos, Google Photos is doing some kind of tagging in the background; it also is keeping track of the date and location, presumably from the data in the uploaded file. The difference is that *you* can’t specify a tagging criteria. It would be interesting to experiment with playing around with the picture file elements that are included in a photo file and see what happens to them in Google Photos. For example, if you altered the date or location or left it blank, what would Google Photos do with it? Could you put something in the “location” field to create your own groupings? If you want to create your own groupings, use the Album feature. One big point with Google photos is that the “unlimited” account reduces the resolution of the photos. If you want to maintain the resolution of uploaded photos, you are limited in storage and must pay for additional storage. Reducing resolution of photos may not be desirable. So now I can use picasa with my MacBook Pro ? I thought I could only use a PC? There has always been a Mac version of Picasa. Thanks so much for this comparison and information. I have been using Picasa but I haven’t been using Google Photos. I am going to start doing so.